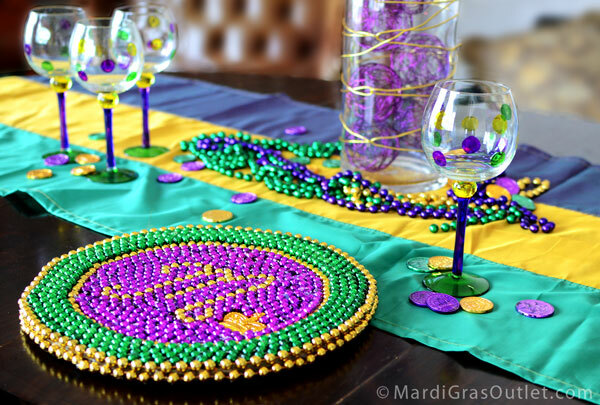 Every perfect Mardi Gras Tablescape comes down to its finishing touches. 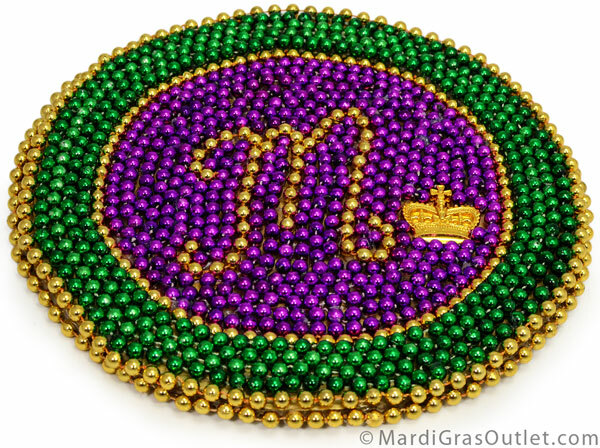 Make yours personal by recycling last years Mardi Gras Beads and creating charger plates for tableware! Create a charger with patterns, initials, or designs with beads from your favorite krewe, for your favorite crew! Your friends and family will notice these place settings at your next gathering. Typical chargers are 10"-14" in diameter. Our finished charger is 14" in diameter which will accommodate most sizes of table ware. 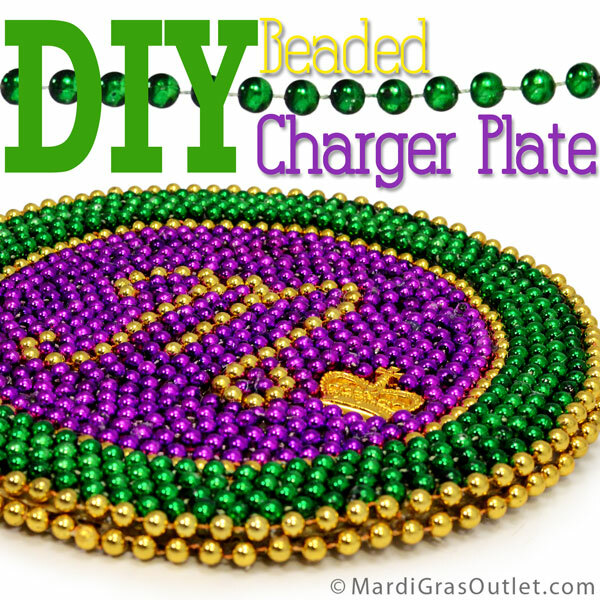 The charger plate can be created in any color combination, and its a great opportunity to upcycle your last years Mardi Gras Beads. If you aren't re-using beads, there are many different color and size options available, (click HERE). The cost of making a single charger is under $5 including the cost of hot glue sticks and new beads. 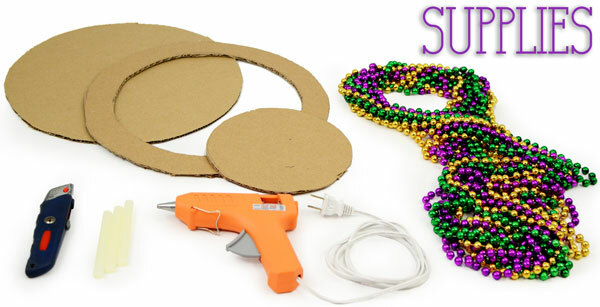 If you are upcycling your old Mardi Gras Beads, that brings the total cost even lower. We used about 5 four inch glue sticks and 10 strands of beads. One charger took under 1 hour to make, and a set of 4 would take about 3 hours. 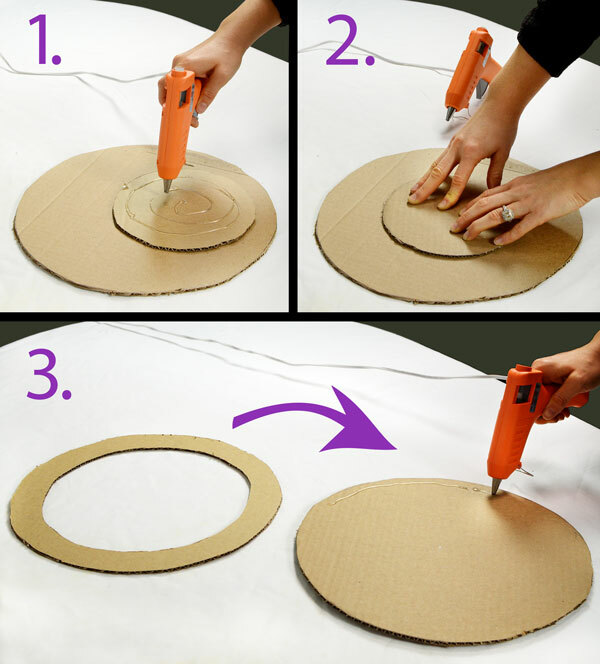 Cut three round disks of cardboard or foam core. The smallest should be approximately 8" across, the 2 larger should both be 13" across. Cut the center out of the third disk, so that you have a 1.5" wide ring, (the outside diameter will measure 13", and the inside diameter will measure 10). Use proper safety when using a utility knife, cutting away from your body and hands. Next, glue the three pieces together. Glue the base to one side. 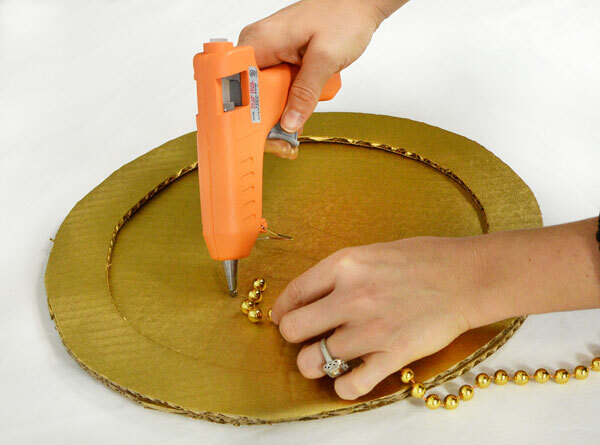 On the opposite side hot glue the rim to the top of the charger's surface, pressing firmly.Use caution with the glue gun and avoid its metal surfaces. This step is optional. We chose gold to continue with our Mardi Gras theme! If you are creating any type of pattern, it may help to trace it on before gluing. Then cut your beads so that they are a long string. There are many variations to choose from when attaching your beads. 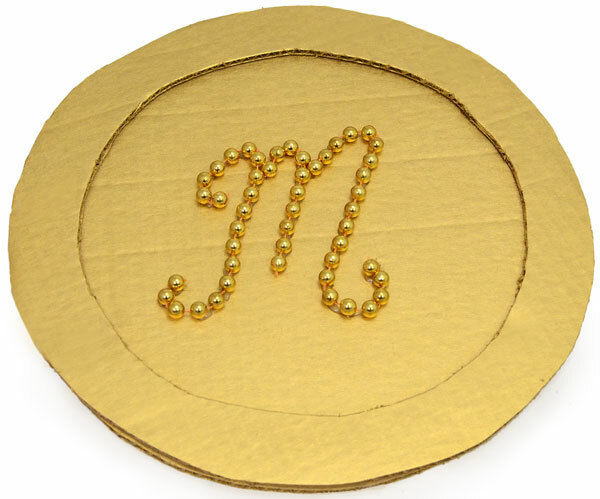 You can choose circular patterns, a solid color, or make it monogrammed! If you choosing a patterned type of design, the bigger you make your charger, the easier gluing the beads will be. Cut your beads whenever necessary. 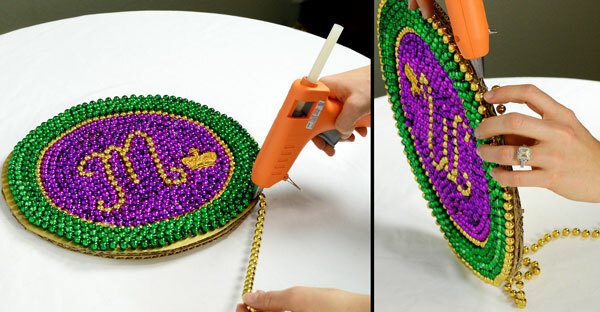 Once you've filled in the inner area with beads, move outwards to the rim. 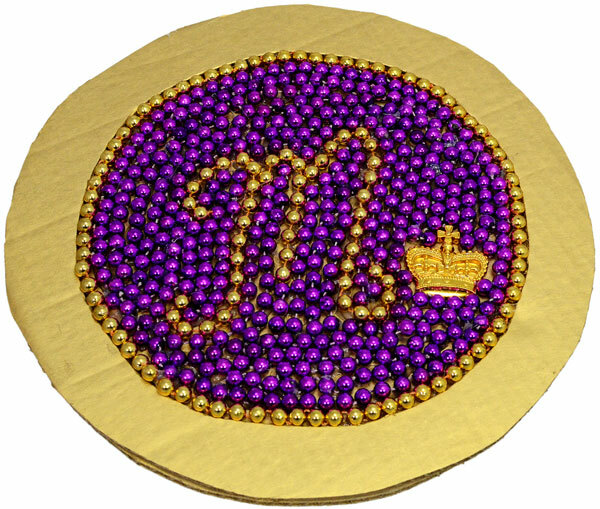 Consider adding medallions or doubloons as a way to display parade mementos. Continue working from the center outwards, and cover the rim of the charger. Glue a final strand around the outside edge and top surface in order to hide the edges of the cardboard. Happy Mardi Gras. Laissez Le Bon Temps Rouler!